The Great Lakes End Table features unique while timeless design. 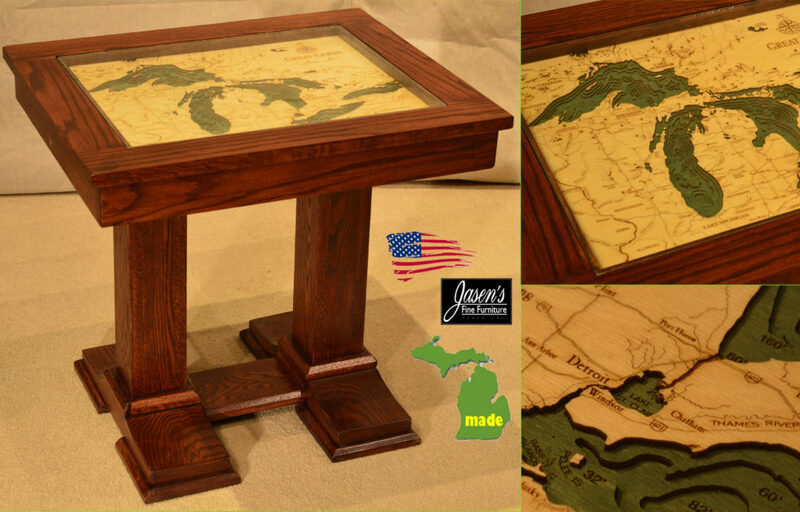 The table showcases the ever popular Great Lakes Map while remaining functional. The table features all solid oak construction. Customers can order the table in any wood specie since it is custom. As a result the table is available in dozens of stains in oak, maple, and cherry. The map highlights the Great Lakes while the three dimensional appearance impresses. This piece is truly a Jasen’s Furniture exclusive. The table is made by our builders in Port Huron. Finally, the table is available with any of the Woodchart Maps. Made in Port Huron, Michigan!